We would love if you could pop by and enter-we have some fabulous prizes up for grabs! Beautiful tree! So glad you joined us this week at My Craft Spot!!! Simply beautiful! I love the look of clean and simple cards, great job. Thanks for playing at My Craft Spot. This is fab...simple but very effective. Love your blog background...it's looks gorgeous. Fabulous tree and great papers. What clever use of your ribbons Elaine. Absolutely amazing card, Elaine. 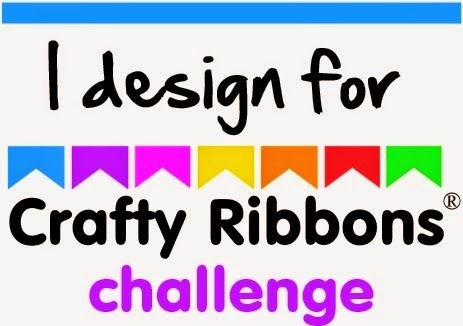 Love the simplicity of it and what you did with all the ribbons is just brilliant. Elaine this is gorgoeus I love it. The colours are beautiful and the simplicity and clean lines are so elegant. What a fun idea for a card! Your ribbon tree looks fabulous! Gorgeous tree! Thanks for joining us at Lexi's Creations this time & good luck! Great use of holiday ribbon! Love your tree! Thank you for joining us this week over at Love to Create Challenge Blog.